With guitars #1 and #2 done, looking good, and sounding fine, it’s time to look forward. For the next round, I will be building two guitars simultaneously. Here I’ll describe the themes behind these two parallel efforts. These guitars are part of a series of guitars, commissioned by Eric Clapton with the artist John Matos, who eventually painted five of them. Later, along these lines, the Fender Custom Shop built 50 graffiti themed guitars called “crashocasters”. With my daughter, I would like to create a cheerful, sunny, colorful Telecaster, painted by us. We are still working on the paint scheme. I expect the rest of the guitar to be a fairly standard Telecaster configuration. Any suggestions? Guitar #4 has an altogether different inspiration. I am a long time Rolling Stones fan, especially of their live music from the late 60s and early 70s. For example, while there is no video, the audio in this YouTube clip shows what you could expect at a Stones concert in 1970: two guitar solos for the price of one, the first by Keith Richards (starting at 3:12) and the second by Mick Taylor (starting at 5:15). Around that time, Keith Richards made famous “Micawber”, his custom Telecaster. Micawber is notable for having a PAF style humbucker in the neck position and 5 strings, Keith having dropped the low E string. Whatever the reason, I thought it might be interesting to interpret Micawber for 2016, a time when tradition is still valued but at the same time pretty much anything goes. I will keep the low E string because I enjoy playing that string (and I use a standard tuning) but my post-modern Micawber will be shocking pink, with a Seymour Duncan Pearly Gates in the neck and a Quarter Pound in the bridge. Also, it will have a 4-way switch, with both parallel and series pickup options available. 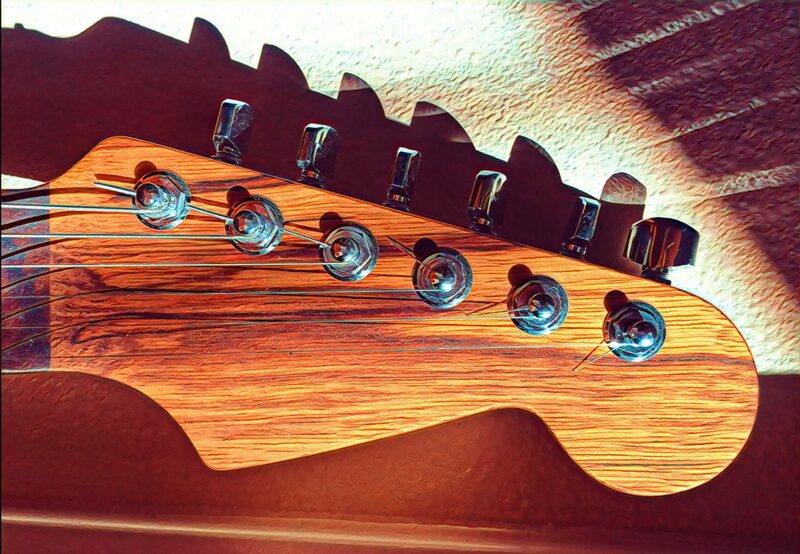 And probably Stratocaster headstock.